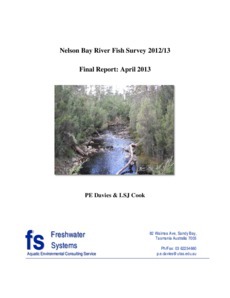 As part of a permit condition for a newly approved mine, Shree Minerals, were required to undertake a baseline fish survey of sites in the Nelson Bay River in November spring and autumn of 2012/13. This report details the results of the spring and autumn surveys conducted at sites in the river –upstream and downstream of the proposed Shree Minerals mine site. The results of these surveys are planned to be used as the basis of ongoing monitoring as the mine development proceeds.